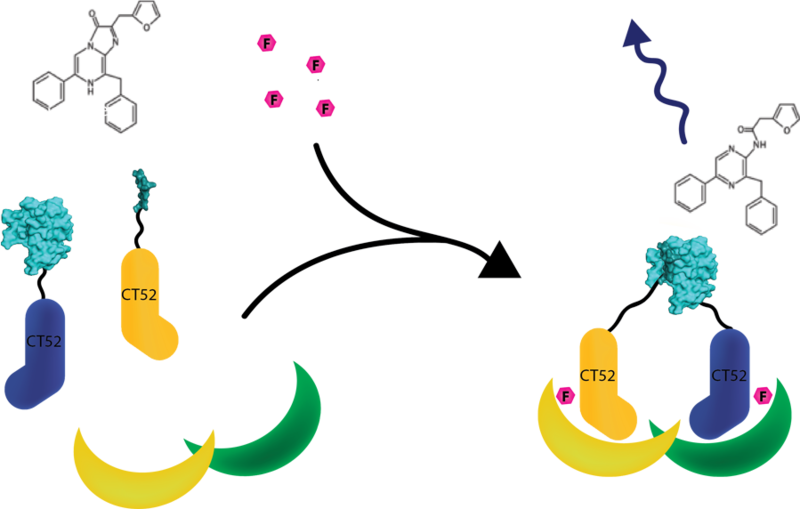 SmallBit is used as an intracellulair signaling domain. In combination with LargeBit  a Bioluminescence signal can be generated by adding furimazine. We verified that this part alone with furimazine gives no signal. The same goes for SmallBit. Therefore, these parts are ideally as signaling components if you want to check if two parts are present. Those two proteins could dimerize on our heterodimeric T-14-3-3 scaffold proteins with mutation which were designed by our team. When dimerized the functional luciferase protein was formed. This protein showed luminescence at 460 nm. This system was used as a read out method for T14-3-3 heterodimers. It is schemtically visualised in figure 1. For more detailed information about the application the NanoBiT system visit our wiki "http://2016.igem.org/Team:TU-Eindhoven/Read-out".